If you are interested in websites and creatively producing online content, then a web developer career might be right for you. Web developers work to produce internet sites that are current and professional. An exciting industry, the internet is full of businesses looking to expand their horizons and gain an online presence for their customers. Web developers need to know more than just how to write code—while graphic artists sometimes come up with the web layout, often it’s the web developer who actually creates the design. Web developers must have a firm grasp on what the current fads are and the ability to produce unique and captivating material. In order to plan out a website that will fit all of the needs of a business you must be able to clearly communicate with your customer and understand what they need and who they want to reach. Web developers must be good at selling their skills and ideas to clients. As with most technical careers, web developers will be required to have a bachelor’s degree in a computer related field. A degree in this field will ensure knowledge of basic design principles, editing programs, and computer languages. An employer will expect an education background and won’t hire without one. Freelance web developers might be able to work without a degree, but will have to build up their experience before being able to have the trust of most clientele. It is much harder to find work in this field without a degree; a lack of expertise and understanding in the field is apparent to employers. With the current explosion of technology, web developers are in high demand and the industry is projected to continue with rapid growth. Technology advances have made web design the go-to place for advertising and communication. This is a solid industry that is predicted to be around for quite a while. The US Department of Labor’s Bureau of Labor Statistics (BLS) projects an increase of 22 percent growth in jobs for web developers—much higher than the average industry growth. In 2012 the BLS reported an average salary for a web designer to be $66,100 with 102,940 employees in the field. The industry with the highest income for web developers was Natural Gas Distribution with a reported average salary of $95,930 and 60 employees. 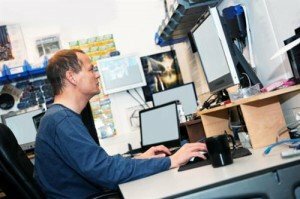 The industry with the highest number of employees was Computer Systems Design and Related Services with 21,650 employees and an average salary of $66,970. Become Educated. Learning languages like HTML, Java and CSS can be daunting on your own, but you need to be well-versed in them. Among other things, understanding layout and color theory is important for successful work in this field. Create dummy sites. A great way to learn, setting up a site for practice will show future employers what you can do. Know what’s out there. Check out the competition and find inspiration by viewing sites featuring the best web designs currently available. This will let you know what has (or hasn’t) been done by others in your industry. Utilize imitation and creativity. Obviously you won’t get far if you directly copy the work of others, but using ideas and layout techniques is a smart way to keep from reinventing the wheel. Add your own creative style to make sure your work is unique. Get advice from others. Whether it’s advice on how to best get into the industry, or a critique on a project you are currently working on, don’t be afraid to ask. Learning from those around you is the best way to get a fresh perspective and stay competitive in the web design field.